Medical Marijuana Services (MMS) held it’s first open consultation last weekend and hooked eight patients up with a doctor who signed off on their medical marijuana prescriptions. Most are patients who have spent years looking for a doctor willing to sign off on the drug, but MMS Patient Navigator Robert Callaghan said there are still more patients who need help. He said few doctors are willing to sign prescriptions for a drug they know little about and changes to Health Canada’s Marihuana Medical Access Regulations will make doctors the gatekeepers for pot prescriptions. 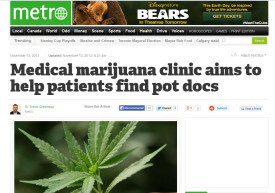 As a result more patients are finding it harder to get access to medical marijuana, he said. “The reason we are in business is because doctors just are not educated as to the effects of marijuana, so they are really reticent to prescribe or help these patients sign up,” said Callaghan. MMS charges patients $500 for the service, or $300 if you are a student or on disability. The fee may seem high, but Callaghan said the patients were “happy to pay it” after having tried every other avenue to manage pain. Pot seems to be the one thing that works for them, he said. “It’s people from all walks of life that need this medicine,” said Callaghan. “They’ve tried everything else in a lot of cases and it doesn’t work for them. They are taking far too many pharmaceutical pills and they don’t like the effects of that. This is a natural, effective remedy for their illnesses. Ottawa medical marijuana activist and legal card-carrying user Russell Barth, who suffers from PTSD and Fibromyalgia, said he has “mixed feelings” about clinics like MMS. While he appreciates the clinic getting patients the medicine they need, he has a problem with the associated charge that comes with it. He said it looks like a “cash grab” for doctors. “It’s ridiculous,” Barth told Metro News. Callaghan said the fee covers the rental of a venue for the consultations, the doctor’s travel expenses and time as well as his firm’s overhead. MMS is holding a second open consultation Nov. 24.